Happy Belated 4th of July. The festivities this weekend were super hectic, but I have material for the next two posts which I'm excited to share later this week. 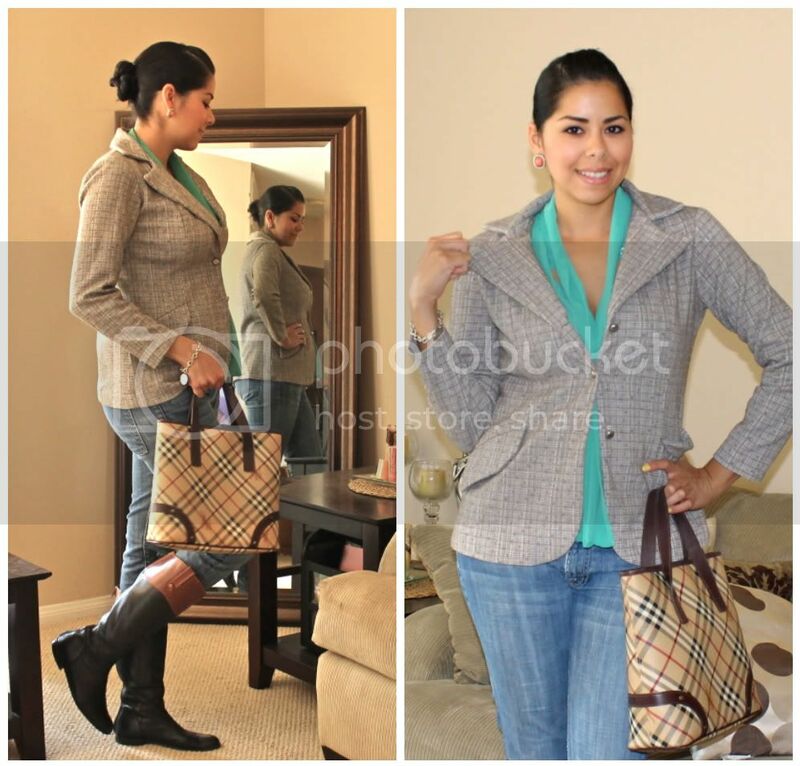 I'm a little late on this particular post, my challenge entry post for Flor de Maria Fashion and Nany's Klozet's "I challenge you to... take over someone else's closet". Borrowed: Jacket (my grandmother's which my sister had taken from her closet back in the day. It was part of a suit but I don't know what happened to the trousers.) // Burberry handbag is from my sister's closet. Gotta love sisters!! I paired all this with my own riding boots which I LOVE. They are from DSW but reminded me of the Gucci ones that Kourtney Kardashian wore in the winter. I share my wardrobe with my mom and my cousin! It helps to have a "second" closet to choose from! 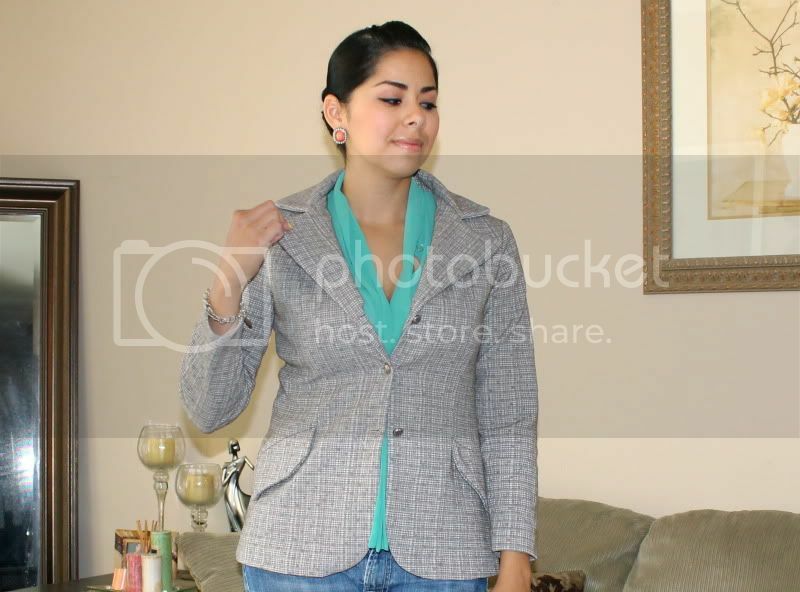 lol I agree, I am lovin that blazer! i TOTALLY want to do this with my sister! i'll have to tell her about it asap :) any excuse to steal her clothing is a good one!! those riding boots..OMG i want them so badly! must find a similar pair! Thank you for your kind words Paulina :) Yes I did pain them! wo! cool love the bag! Nice outfit! So stylish, you look great! Thank you! I like the colours in your outfit! I LOVE the boots! you look great!! you look so pretty! i love the boots too!! they remind me of Kourtney's boots too, that's the 1st thing I thought!! awww super cute that you get to wear your granny's blazer. I LOVE your boots too! lol I have been dying for a pair of riding boots yours are great! are you Mexican?? so you speak spanish?? eres Mexicana? entonces eres mi paisana, que gusto!!! ... te invito a que te pases a conocer mi blog tambien, jeje espero que te guste!! Un beso enorme desde México Df! High End to Cost-Effective: Bright Handbags! Opening Day @ The Del Mar Racetrack!